Did you know that the name “Memorial Day” wasn’t used till 1882? Originally Memorial Day was known as “Decoration Day” (something some people in the South still have, completely separate from Memorial Day). “Memorial Day” also wasn’t the official name of the holiday (by federal law) until 1967. Plus Memorial Day was originally on May 30th – until 1968, that is, when Congress passed the Uniform Monday Holiday Act which moved Memorial Day (and a few other holidays) from their regular dates to certain Mondays, so as to create convenient 3-day weekends (thanks, guys!). Even this didn’t take place on a federal level till 1971 though, and even then, it took a few more years to implement across all 50 states because some states just weren’t having any of it. So, while Memorial Day is technically an old holiday, several aspects are much newer. Memorial Day is also a great time to add some NEW into your life, seeing as how it’s the “official” start of summer. New season, new goals, new changes. It’s why we’re having a HUGE Memorial Day sale until June 3rd! Right now, we have store-wide savings up to 67% off! Plus enjoy an INSTANT sales tax rebate, 5 years FREE financing with no interest till 2023, and an instant FREE delivery rebate. The awesome doesn’t stop there though. At Suburban Furniture we know that sleep is power (and sleep = happiness for a lot of us!) so we’ve added a HUGE mattress sale to help make your life even better! How does a Sealy gel memory foam mattress starting at $9/month sound? (Pretty great, right?) And we offer a 90-day sleep happy guarantee! So how about adding some newness to your life during this old-new holiday weekend? And finally, as to the actual reason for the Memorial Day holiday, we at Suburban Furniture praise the men and women who sacrificed their lives in the name of our country. Their selfless devotion, outstanding courage, and honor inspire us to make their sacrifice meaningful. Thank you, one and all. We’ve been talking about the importance of healthy sleep lately (are you better rested yet?). Now that you know the basics of good sleep, what’s the next step? Finding the perfect mattress, of course! You spend a lot of time in bed, so it is important to choose a mattress that will help you get the best night’s sleep possible. Mattress size will be a major factor in your decision, but there are several other things to consider while you browse for the ideal mattress for your bedroom—room size, the amount of sleeping space you require, and a person’s height to name a few. Let’s take a look at some mattress info! Also known as a “single” mattress. Great in children’s rooms and smaller bedrooms. A narrow bed that is easy to move and fits almost anywhere. Sometimes called a “Double” mattress. Wider than a twin, but still limits sleeping space for two adults. Cons: Considered by many to be too narrow for two adults. At 75″ in length, may be too short for some. Longer and wider than a full, a queen is more accommodating for two adults. A good choice for smaller master bedrooms. Cons: Only slightly more sleeping width per person than a full. Some bedding is sold as “Full/Queen” and may not perfectly fit either size. Sometimes referred to as an “Eastern King” and offers the same width per person as a twin. A king mattress uses two twin extra long sized box springs. Also known as a “Western King” mattress. This may be the preferred choice of taller adults and adds a foot in width and four inches in length to the standard queen. Pros: More length to accommodate a taller person. Ample width for two adults. Now that you’re armed with the info you need to make the most informed decision, it’s time to shop for and try out mattresses! Bounce on over to Suburban for the most knowledgeable sales staff AND take advantage of our Fourth of July sale! Up to 67% off furniture & more storewide, interest-free until 2022, plus instant free delivery rebate – to say it’s all a bargain would be an understatement. This sale won’t last forever, so stop by soon! Join us for our Half-Off Sale!! We’ve been showing off some of our featured furniture makers recently and going in depth about their stories and what kind of furniture they make so why not come in and check them out yourself? Right now is the perfect time to do so because it’s time for our Half-Off Sale! 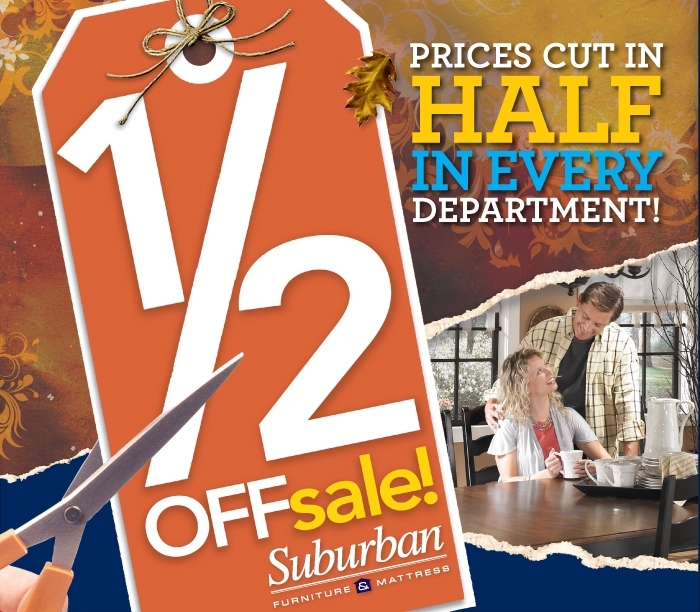 Don’t worry, you aren’t mishearing us – prices have been cut in EVERY department! Are you looking for a little style change to accompany autumn? Maybe you’ve just moved homes and are eager to redecorate your new pad with a brand new vibe? Or perhaps you’re just looking to replace a worn piece of furniture and have been putting it off. Whatever the case may be, we have the perfect item for you! Hurry and visit now before the half-off sale ends – who doesn’t love 50% off their favorite items? ?